« Let’s not raise our children for the world of today. This world will have changed when they grow up. Maria Montessori, The Absorbent Mind of the Child. Maria Montessori is an exceptional woman, avant-gardist in many fields and Italy’s first female physician. She continued her studies in biology, psychology and philosophy. She began her career working with mentally disabled children, whom with she developed great observation skillsregarding human nature. She, then, dedicates herself to their development and struggles to ensure that they are respected and stimulated. To structure her approach, she draws inspiration from two French doctors’ work, Jean Itard and Edouard Séguin. She first started to accompany the children with the material created by Séguin. Given their spectacular results, she decides to turn to children without disabilities and offers them the materials she had designed. In January 1907, she created the first Children’s House in the working-class neighbourhood of San Lorenzo in Rome, where she was entrusted with the care of young children who had been left to their own devices. At the time, she made manufactured custom-made material adapted to the size, age and she continued observingthe children’ evolution. It is in this way that she discovers the basics of her pedagogy, which she calls scientific pedagogy and then Montessori pedagogy. What does she find out? have great ability to concentrate! They allow themselves to be absorbed by the work they do and can carry on with it for a very long time, from an early age. On one condition: that the materials offered to them be adapted, attractive and made available to them. absorb knowledge with ease, fluidity and happiness! maintain their insatiable thirst for knowledge. acquire, through repetition, a sense of competence that gives them a positive image of themselves called self-esteem by psychology. This being the basis of self-confidence, they will thus progress towards the acquisition of a solid self-confidence. require order and cleanliness, it reassures them and helps them to structure their thoughts. need not to be interrupted in their work and to do things alone. spontaneously take an interest in the care given to the environment, nature and life. are enthusiastic and share this enthusiasm with their families. In this sense, they “educate” their families and work for the harmony and positive evolution of society. The children’s progress will be so impressive that they will be featured in the Italian and international press. 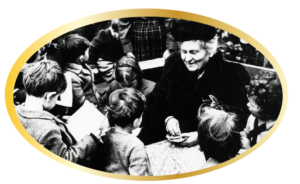 From then on Maria Montessori will create teacher training courses and Montessori schools will multiply all over the world. Today, there are 30,000 schools in more than 50 countries which is what she was hoping for: her pedagogy would be accessible to all in view to allow the flourishing of beings and the education for peace. Its avant-garde, humanistic and societal vision makes it a timeless pedagogy adapted for children of today and tomorrow on the 6 continents. Based on the child’s development which is universal, and confirmed by the discoveries of neurosciences and positive psychology, it is recognized for its efficiency and modernity! in spite of his age! The Absorbent Mind of the Child allows him to absorb all that his environment offers (language, politeness, culture, adapted behaviours…). He assimilates all the experiences lived and builds himself by integrating them. This mind is guided by instincts – inner impulses that invite the child to turn to a specific aspect of his environment which will serve his development. This so-called sensitive period corresponds to a stage of the child’s growth..
Each period is necessary for the construction of the Being. New needs emerge at each stage. Maria Montessori recommended adapting the educational system to each of these stages by responding to these specific needs. Freedom : the child must be able to evolve freely in a secure and adapted environment. This requires careful preparation of the environment. Free choice of activities he wishes to carry out and their duration. This allows each child to satisfy his learning needs. In addition, he can speak freely but in a low voice and solicit the educator by placing a hand on his shoulder. He can also move freely without running and by controlling his gestures so as not to disturb others. Thus, he learns respect for the other while having a certain freedom. Self-discipline exercised through self-control of the child’s own error. Action on the periphery:Maria Montessori advocated acting on the environment rather than directly on the child to promote his flourishing. Respect of the rhythm of each child, there is no competition, no comparison, no notes so the child can evolve without pressure, following his impulses related to the sensitive periods he goes through. Learning by experience to move from concrete to abstract is what he does by observing, manipulating. Individual activity respect for each individual’s rhythm and learning by experience require individual work. Education lived as an aid to life. For Maria Montessori, it is a question of helping the child to have an inner discipline and a great respect for the other and for the environment. Thus he will be ready to live a harmonious social life. It has been scientifically developed from the observation of children. It isolates a quality thus a great quantity of material will be necessary in a Montessori class. It is sensory. It allows the child to exercise his senses and to manipulate in order to understand, thus moving from concrete to abstract. It is adapted to the strength and size of the child. It is aesthetically pleasing, made of noble materials (wood, porcelain…), thus inviting to the activity. It authorises self-correction which develops autonomy and self-confidence. It is placed in a precise order on the shelves within reach of the child. This order corresponds to the pedagogical progression proposed by Maria Montessori. There is only one copy in the class, teaching the child to wait, respect the work of other, his rhythm, which will develop an excellent socialisation and a good management of the natural impatience of the Being. In a Montessori atmosphere, a specific area is reserved for each family of material. 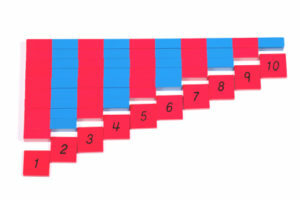 There are 8. 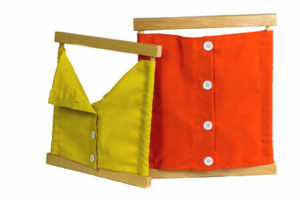 The material is placed on trays, boxes or baskets adapted to children, allowing them to move and store the material easily with calm and concentration. Each activity is presented to the child by the educator when, through careful and benevolent observation of the child, he notices that the child is attracted by the material and is therefore ready to discover it. The presentation will then take place in three distinct and progressive phases named: three-stage lesson. Many games accompany these individualized lessons making them playful and enjoyable. • Practical life materials: it allows children to imitate adults. A natural phenomenon that helps them understand the environment in which they live and helps them to develop belongingness. It is made up of materials that the child meets in daily life to make precise gestures (use a glass of water, transfer, spin a sponge, squeeze an orange, sweep, water the plants, take care of the animals). These gestures require concentration, their success nurtures the self-esteem that is to say, the way you look at yourself, which is the prerequisite for building a beautiful self-confidence. • Sensorial materials: allows the child to develop his fine sensitivity, observe, manipulate, discriminate and compare. Moving from concrete through exploration to abstraction. He thus develops his mathematical thinking. • Materials for Mathematics: Through play and manipulation, the child encounters the world of numeracy, learns to count and discovers great mathematical concepts such as the decimal system, the four operations and the transition to abstraction. • Materials for Language: since intrauterine life, the child is in a language immersion bath. He gradually integrates the vocabulary proposed by his environment. His vocabulary will be enriched by books, sequential stories, (posters, photos…) to comment. The child will also play with sounds, learn to recognize them orally and then write them using rough letters. He will learn to write and read in a playful and natural way. 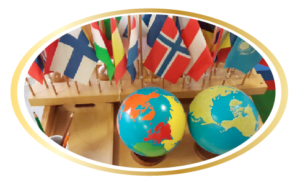 • Materials for Geography: children learn to orientate themselves, structure the organization of space, discover earth, oceans, continents and other cultures… They work with the globe, maps and flags, enriching their vocabulary and cultivating tolerance. • Materials for History: history is linked to the notion of time. Notion that gradually settles in the child from 2 to 8 years old. The proposed activities will therefore be preparatory: identification work on the day, week, month, seasons and important events. The goal is that they gradually locate themselves over time. • Materials for Science, Botany, Zoology: this material aims to help children discover the world in which they live. Give them the opportunity to explore it through experiments. They will take care of the environment and become environmentally conscious. Since the school has a greenhouse, we will be able to carry out plantations there and observe the living develop. • Music: children will be invited to discover music through a listening area where singers and composers from all periods will be proposed. In addition, each day they will share a time of songs, rhymes and dancing games. • Plastic Arts: Painting, drawing, collages, drawing forms, art books. All this material is at the children’ disposal to allow them to give free rein to their imagination, creativity, discover various techniques and artistic medians.